You may have noticed that when people are trying to sell you something, they sometimes offer you food. I always assumed this was in the nature of a bribe, which may be effective but isn’t what you’d call subtle. However, it turns out that it’s more complicated than that. A psychologist named Gregory Razran, writing in the 1930s, was one of the first to show that people liked ideas more if they were introduced to them while eating a meal. That’s not a difficult idea to swallow: we’re often in a better humour when we’re eating. But there’s even more to it. You’re probably well aware that caffeine makes you more alert, but did you know that it makes you more susceptible to persuasion? Pearl Martin and her colleagues asked their study participants to drink a glass of orange juice that might or might not contain caffeine (about as much as contained in two cups of espresso coffee) before reading several stories that argued against voluntary euthanasia. The participants then filled out a questionnaire that asked about their attitudes toward both euthanasia and abortion. When they compared the participants’ attitudes to those they had reported at a previous visit, the researchers discovered that while the group as a whole were somewhat influenced by the arguments they’d read, those whose juice had contained caffeine shifted their attitudes the most. Interestingly, the arguments against euthanasia also shifted the participants’ attitudes away from acceptance of abortion – and this shift was also more pronounced among those who had drunk caffeine. Food can have an even bigger effect on our attitudes and decisions. Shai Danziger and his colleagues charted the outcomes of more than a thousand parole board hearings that took place over 10 months. 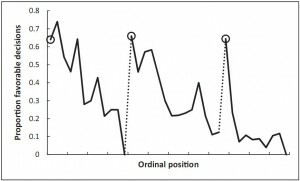 The graph below shows their results according to the order in which each case was heard, with the dotted lines showing when the judges chose to take a break to eat. 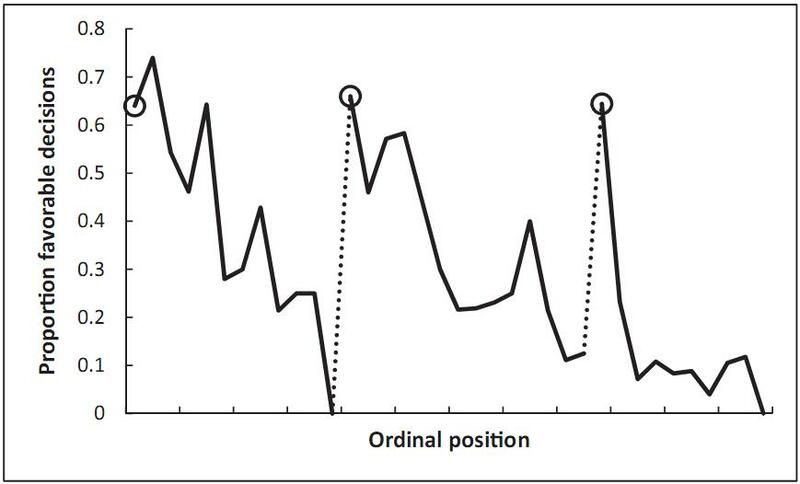 The height of each point shows how likely the judge was to grant parole at that time of day. As you can see, the judges granted parole to about six in 10 prisoners at the beginning of the day and after each food break. However, over the few hours after each break, the likelihood of their granting parole dropped to almost zero – and this pattern occurred with all eight judges involved in the study. Factors related to the prisoners (such as number of previous prison terms) also affected the outcomes, of course, but time of day sometimes had more effect. One explanation is that making decisions is draining and taking a break allows us to replenish our mental resources. Also, as we saw in a previous post, making decisions uses up self-control and one way to restore it is by increasing our body’s glucose (sugar) levels – such as by eating. When self-control is low, we’re particularly likely to opt for the default choice, which for the judges was to refuse parole. This doesn’t mean you should start feeding everyone you’re trying to persuade (although if I’m your target, please feel free! I particularly like chocolate biscuits). It does suggest, however, that timing can be important. Hungry people will be less likely to make behavioural changes or difficult decisions. Caffeinated people will be more open to the message you want them to adopt. And those bowls of candy you sometimes see at information tables or sales booths? People who eat the candy are indeed more likely to be persuaded afterward. 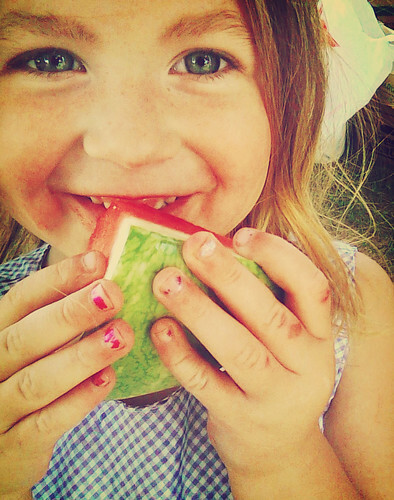 If you want to remain uninfluenced, don’t take candy from strangers. And for that matter, don’t drink the Kool-Aid, either. « Your price or mine? Subscribe to comments with RSS or TrackBack to 'Eat, drink and be wary'. Very interesting! 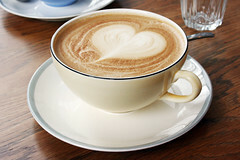 2 things occurred to me – I didn’t realise when I stopped talking caffeine I was making myself less easily influenced! And second, the best time to change people’s behaviour is when they come out of *generic coffee chain*, rather then when they’re standing in the queue. In unrelated news, there seems to be an issue with the last image on the page. Thought it might be handy to know. You’re right, catching people on their way out of a coffeeshop would be exactly the right time to persuade them… something interesting to remember. And thanks so much for mentioning the image problem so that I could fix it!